This post is for my US readers since they make up the vast majority of my readership (I’ll cover other areas later). UPDATE: I now HIGHLY recommend The Protein Works for all my UK and European readers. They have the best quality supplements in Europe. The Protein Works is also where I get my own supplements. So what criteria is used to decide upon a great whey protein supplement? Whey Isolate is simply a purer protein than concentrate. That means that for every scoop you take, you are getting more actual protein and less of anything else i.e. sugar and fat. A protein powder containing around 90% protein will do the trick nicely! As a low-carber I also want the least amount of carbohydrate in my protein shakes. I’d rather spend my daily carb allowance on actual food thank you very much! 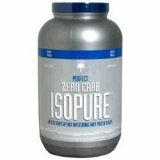 One product that fits the bill brilliantly is Zero Carb Isopure by ‘Nature’s Best.’ As the name suggests it has no carbs per serving and is around 90% protein. And there’s a great bonus with this product. As you know, I recommend 5 grams of L-Glutamine in your post-workout shake. In every serving of Zero-Carb Isopure you get 4.6 grams of L-Glutamine along with your 50 grams of protein. So, for post workout nutrition, just add your creatine and you’re all set! This product is perfect for both bulking up and cutting fat. You’ll save money by not having to buy the glutamine separately and also, by ordering through Amazon.com, you’ll get free delivery. (Please note that the Dutch Chocolate flavor contains 3g of carbs per serving). Just looking a great all-round whey protein at a good price? In that case I think Optimum Nutrition Whey Protein is the way to go. It comes in a variety of great flavors and should fit anyone’s budget. The best US price I found for this is at Fitness First USA, and I love the product. Australia tends to have ludicrously rip off prices. Just found this website today and it seems like a great idea. I was wondering though…What is your opinion on using casein protein? How exactly does whey protein and casein protein affect insulin levels? Is there any benefit or detriment to taking casein protein while performing the MANS diet? It’s nice to see an endorsement for ON’s whey protein. I’ve been using it for 2+ years and have reaped the benefits, both physically and fiscally. I once ordered 20 pounds of ON’s optimum whey from Holland on bulknutrition.com. I was definately pleased with it, It dissolves perfectly and the vanilla taste is great. I also tried the tropical punch taste, but that was way to sweat for me. Considering the highly advantageous euro/dollar exchange rates it’s definately worth considering if you want to save some money. Even despite rather high shipping costs for the weight and the added customs taxes and crap. The prices just seem to bee rediculous in europe/holland compared to the US prices. does anyone know of an unflavored protein powder? Hi, I’m not a body builder. I am researching Whey Protein for other reasons and hope you may be able to help me. My purpose: under stress, skipping meals – I want as a meal replacement – for when I skip a meal. And for added Protein throughout the day. I need PROTEIN and have problems with sugar. Not diagnosed with any sugar problems BUT my body reacts — without a meal I can’t have sugar. I’d rather no sugar or very low sugar content. if you can recommend a whey protein with and without carbs – low in sugar – I would greatly appreciate it. Hey Mark, I am 16 years old and I started bodybuilding about 6 months ago. Anyway, my mom works in a a health related field (she sells a product called Juice Plus that is basically dried fruits and vegetables) and she thinks that whey protein is harmful due to research in something called the China study and a doctor that she knows says dairy has been shown to be harmful and animal proteins as well. I convinced her that it is okay to at least eat a serving of meat every day, but she won’t budge on whey. I don’t know whether or not whey protein is harmful, so I would like to get your opinion on this. Obviously you don’t think it is harmful because I see you take it a lot, but I love your articles and I value your opinion greatly so I look forward to your response. Thanks! I forgot to add this in my last post, but I am making great gains even without whey. I am currently using rice protein which has about 12g protein and only like 2g carbs per heaping tablespoon. I have gained gone from about 135 pounds 9% bodyfat to about 140 pounds with only a very slight increase in fat. Therefore I do not know if it is worth using since there is the possibility of it being harmful.